I really like these stamps from Stampotique. I also like stepping out of my comfort zone and mashing up colours I wouldn't usually be drawn to. My default setting is muted shades which all match and I spend ages pulling out various bits of card or ribbons to check they compliment each other. This has been an enjoyable departure from my self imposed rules and I hope you like the result as I do. 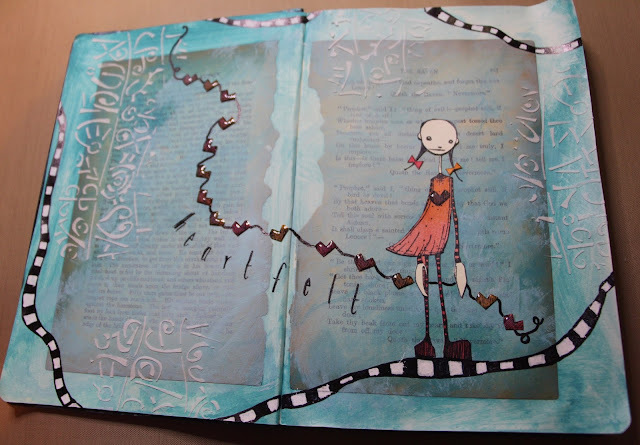 For this page, I stamped the heart from her dress several times and cut them out to make the line of hearts blowing in the wind. Then I covered the hearts with Glossy Accents to give them an extra dimension and sheen.